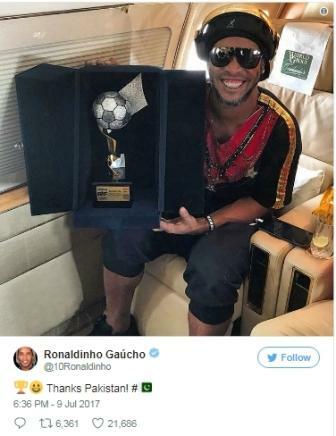 In his glory days, Ronaldinho's toothy smile became as famous as his sublime skills with the ball which earned him two Fifa World Player of the Year awards. Now, the iconic Brazilian footballer put smiles on Pakistani sports lovers' faces with a beautiful message to the country on Twitter. "Pakistan is peaceful & loving. Thanks #PakArmyChief Thanks #Pakistan See you again... @OfficialDGISPR @LeisureLeaguePK @wgtrunkwala1912," twitted the former Barcelona player after taking part in two seven-a-side exhibition matches in Pakistan. The two games were organised to encourage youngsters in the cricket-mad country to play the beautiful game. 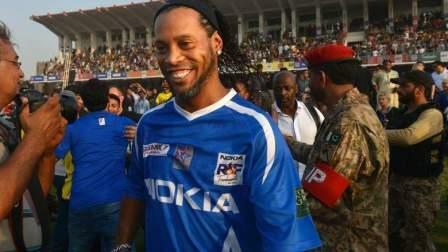 Ronaldinho was not the only global star to have played those two exhibition matches. The group named 'Ronaldinho and friends' included Manchester United legend Ryan Giggs, former England goalkeeper David James, George Boateng of the Netherlands and former France and Arsenal stars Robert Pires and Nicolas Anelka. "Thank you for all the admiration and treating me so well," Ronaldinho was quoted as saying by AFP before the second match. Leisure League, the organisers of the matches, wanted to promote football in Pakistan and show the world that Pakistan was a safe country for international sports. Since the 2009 terror attack on the Sri Lankan cricket team's bus in Lahore, Pakistan has been boycotted by major international cricket teams for security reasons. Pakistan's cricket team have been forced to play their 'home' matches in the UAE. Cricket has suffered in the country ever since that 2009 attack. But their stunning triumph in the Champions Trophy last month has lifted spirit of a nation and they are now hoping to welcome back international cricket teams. Now this effort to bring iconic footballers to Pakistan will only boost their chances. Thousands of people attended the two matches in Lahore and Karachi. "Football is huge here especially with the younger generation," Giggs was quoted as saying by AP. The Ronaldinho-led team won both the matches against the Giggs-led team. "We want to give a message that Pakistan is a safe country to visit," Giggs said.